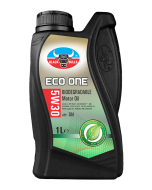 Black Bulls ECO-ONE is High Performance Bio-based Motor Oil. It is formulated with advanced chemistry to provide optimum performance in turbocharged and supercharged gasoline engines. Stabilized HOBS give a high viscosity index, that is higher than the mineral and synthetic base oil, providing less mechanical and thermal shear, reducing viscosity breakdown. HOBS provide superior friction reducing properties and having no volatility comparing to mineral or synthetic base oils. All these high-performance advantages provide a more energy conserving formulation that increases fuel economy and reduces emission. Suitable for all gasoline, diesel, gas or duel fuel engines of passenger cars, light duty commercial vehicles, and off-road SUV’s requiring API SN with 10W-30 viscosity grade or as recommended by the OEM. It helps lower the maintenance cost by keeping your engine clean providing reduced engine wear and improving performance. High performance benefits of stabilized HOBS formulation. Keeps your engine like factory clean. Superior wear and corrosion protection. Excellent fuel economy and energy efficiency. Longer drain intervals and smooth running of engines. Helps quick cold weather starting. For modern gasoline, diesel, gas and duel fuel engines or as recommended by the OEM. Serves best for high-end German, Japanese, Korean cars and buses wherever a lubricant of this grade recommended by the OEM. Suitable for all engines requiring API SN Oils such as SN, series and 5W-30 viscosity.